അഴിമെതിക്ക് എതിരെയാണ്‍ പ്രശാന്തെങ്കില്‍ സ്വതന്ത്രന്മാരെ പിന്തുണക്കുകയായിരിക്കും നല്ലത്. ഒരുമുന്നണി പരസ്യമായി ചെയ്യുന്നു, മറ്റേമുന്നണി രഹസ്യമായി അതിലും ഇരട്ടി നടത്തുന്നു. അതിനാല്‍ അഴിമെതി ഐ തെരെഞ്ഞടുപ്പില്‍ വിഷയമാവാന്‍ സധ്യതയില്ല. 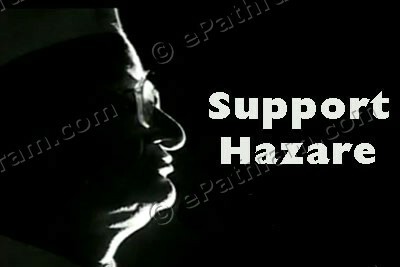 Anna Hazare’s fast for a stronger Lokpal Bill received extra ordinary groundswell of public support as the people all over the country are extremely angry against the multiple scams and the criminal scamsters plundering the wealth of the people, making them pauperised. The debate in the parliament following the 2G Spectrum case and exposures by the WekiLeaks including the arrogant and reactionary statement of the prime minister, and the tardy way in which the investigations are being carried forward by the CBI and other agencies have only made the vast masses angrier. As corruption is becoming rampant in all fields, the reluctance of the consecutive central governments to draft a tough Lokpal bill coupled with the reluctance to enact it in spite of eight attempts from 1968 was becoming more glaring. In spite of latest assurances the UPA government was once again trying to linger with the process. All over the country the people are becoming more and more aware of the criminal ways in which the rivers, the minerals, all other natural resources, the mountains an even the habitats of the adivasis, dalits and all other oppressed sections were being plundered and the elite class becoming fabulously rich as a result. The central and state governments irrespective of which party or combination of parties are in power, the bureaucracy from top to bottom, the police and para military forces, the military and even the judiciary are getting exposed as rampantly corrupt before the people. The way the Central Vigilance Officer was appointed had shown that from prime minister to all all instruments of the state machinery are not bothered to fight corruption in any serious manner. On the contrary all, including the investigating agencies were exposed as corrupt. In this situation, as Anna Hazare came forward and annonced his fast to focus on an effective Lokpal bill, it recived such a great support all over the country. The prevailing atmosphere of mighty upheavals in North Africa and Weat Asia where in a large number of countries millions are coming out in the streets against decades long corrupt and despotic rule of dictators also played a role in the people , especially the middle class, coming out extending overwhelming support to the fast. Fully aware of the limitations of the struggle led by the ‘civil society groups’ led by Anna Hazare, all the progressive forces had extended support to the struggle against corruption. corruption. It is also depicted as a vicotory of the civil society groups over the legislatureby some. The middle classes are celebrating it as a great victory over the evil forces dominating the country. While accepting the dire need for intensifying the struggle against the mega level corruption rampant in the country and the significance of any struggle that succeeds in mobilising the people in it, it is necessary to explain the limitations of the struggles led by the civil society groups an NGOs to find solutions within the existing ruling system to end the evils like corruption created by the very same system. It is a fact which cannot be denied by anyone that the corruption and scams as we know them today originated with the capitalist system. As capitalisim transformed in to monopoly capitalism and its speculative charecter increased manifold, the ruling systems in the imperialist countries and in the countries dominated by them became rampantly corrupt with the power-sharing elite classes utilising corrupt methods to accumulate wealth through all dirty methods. So corrruption is part and parcel of the ruling system and it can be erradicated only by putting an end to this ruling system itself. The civil society groups and NGOs who are promoted by the very same ruling system are consciously concealing this fact. It is also part of their post modernist concept of delinking the struggle against various aspects of ruling system. Even when corruption like ecological destruction, poverty, unemployment, increasing ailments, oppression of women etc have taken such monstrous forms under the dominating imperialist ruling system, and none of them can be put an end to without fighting against the ruling system with the orientation of destroying it, they under the theory of ‘deconstruction’, advocate struggle against each of them as if they are unconnected identities. They advocate that the consequences of the imperialist policies pursued by the ruling system can be fought separately and can be resolved within the ruling system itself. Thus all struggles are led to reformist path They serve as safety valves to weaken the people’s struggles and ultimately to save the ruling system. It can be easily recognised if we try to relate the fast of Anna Hazare with his assessment of the ruling system and about the virtues of chief ministers like Narendra Modi. Corruption has become rampant as a resullt of the imperilast system and its lackeys becoming unprecedentedly speculative, greedy and plundering. As a result all sectors of administration and the state machinery as a whole has become rampantly corrupt. It has spread to mall realms of life.The political system including the political parties have become wantonly corrupt. In this situation all forms of struggles and mobilisation of the masses to fight to corruption should be welcomed, any theorisation that it can be erradicated within the system should be uncompromisingly fought against. The struggle to end corruption should be taken up as an integralpart of the struggle to ovetrthrow the ruling system itself and developed with all the might. This is an important aspect of the revolutionary struggle which should be correctly put forward to mobilise the masses.